A very attractive oak front door with a rustic, country style appearance. The door has been fully restored, stripped to bare wood, and has a lovely colour and grain. The door is planked and ledged with thick pegs holding the ledges. There are attractive cast iron door straps at the top and bottom of the door and a black metal letterbox. We believe the strap bolts are equally spaced and so we could turn the straps around if you require the door to open on the other side to its current set up. Please let us know at time of purchase if you require this service. Hinges will need to be supplied by purchaser. The door is ready for finishing by purchaser, with perhaps a varnish, oil or wax, suitable for exterior use. The door is reclaimed and therefore has some signs of wear. Very slight marks and scratches to the iron door hardware. The base of the door has some cracks. The door has had some small patch repairs. Some light knocks and scratches and some filled wood knots. 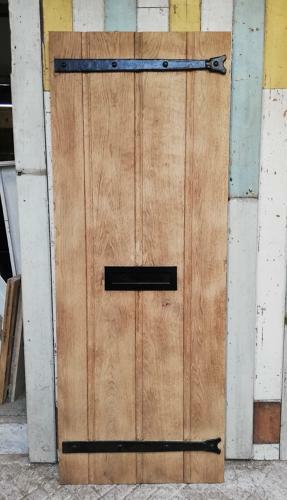 The door is solid, with great style, ideal for a cottage or period country home. The oak is of a fantastic quality and the door is a very desireable item.